Part 2 of this workshop will concentrate of construction. These workshops will be presented by architect, eco-builder, writer and teacher Peter Cowman who has a special interest in the creation of affordable, healthy, low-impact, mortgage-free buildings and has developed a unique timber framing system for cost-conscious self-builders. 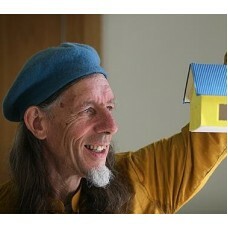 Originator of the ‘sheltermaker’ and ‘living architecture’ concepts Peter’s work has been widely publicised in both print as well as broadcast media, worldwide.